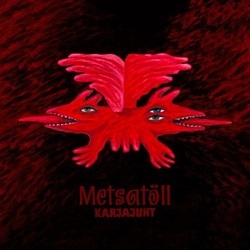 Estonian folk metallers Metsatöll from Tallin will release their sixth studio album “Karjajuht” (“Pack Leader”) on March 7th 2014. On its new album Metsatöll has employed a new approach towards its traditional ideas and notions of folk metal. The average pace and tardy epics of its latest studio albums are now things of the past, while new tracks are energetic, melodic and seductive. Naturally, Metsatöll’s entire park of folk instruments from zithers to bagpipes is engaged as well. The record includes 12 tracks, of which “Lööme Mesti” has already been playing in radios. Today a second single reached the radio stations. A track called “Tõrrede Kõhtudes” is dedicated to the making of a very important Estonian beverage. Metsatöll leaves it for the listeners to decide which beverage it is, although the mentioned ingredients do not leave much room for guessing. “Karjajuht” was produced by Metsatöll and Samuel Ruotsalainen. The tracks were recorded and mixed by Keijo Koppel and Marko Atso at the RoundSound Studios in Tallinn in September and October 2013. The album was released in cooperation with Spinefarm Records, an affiliate of Universal Music. The author of the album’s front cover is traditionally a recognized Estonian artist Jüri Arrak. While the previous two albums of Metsatöll included the artist’s earlier creations, then this time the painting “Pack Leader” was created especially for the album. “Karjajuht” will be released in the form of a CD, limited moving digipak CD and vinyl and it can be pre-ordered as of today from the band’s e-shop.